To computationally construct molecules by adding atoms and introducing bonds. This helps to develop new structures and manipulate already existing structures. It also helps to understand the construction of biologically important molecules. A molecule is a small chemical element that is made up of two or more atoms held together by chemical bonds. A molecule can be composed of either single kind of element (e.g. H2) or different kinds of elements (e.g. CO2). Molecules can be found in both living things and non living things. A drug is a small molecule that can interact, bind and finally control the function of biological receptors that helps to cure a disease. Receptors are proteins that interact with other biological molecules to maintain various cellular functions in body. Enzymes, hormone receptors, cell signaling receptors, neurotransmitter receptors etc. are some important receptors in our body. Drug design is a process of designing small drug molecules that can interact and bind to a target biomolecule. For example, Aspirin is a small pain killer drug molecule which contains nine carbon atoms, eight hydrogen atoms and four oxygen atoms. Design of the molecules should be complementary in shape and charge of the target. Molecular modeling includes computational techniques that are used to model a molecule. Drug designing by using these modeling techniques is referred to as computer-aided drug design. Computer based drug design is a fast, automatic, very low cost process. It can be either target based or structure based design. Building a molecule using computer techniques is a very important step in drug deigning. There are so many computational tools available for building a molecule. 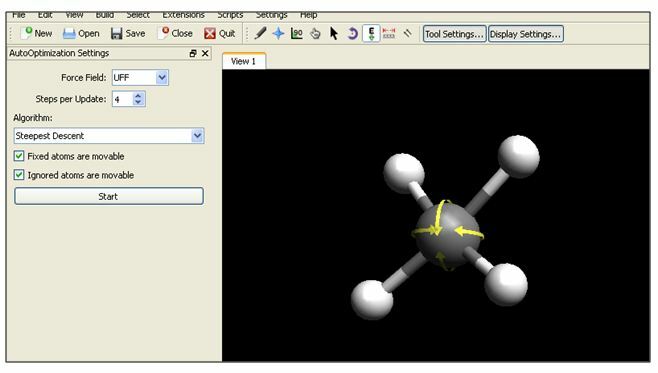 Avogadro is free open source molecular builder software designed for molecular modeling. It allows building of chemical structures, visualization and analysis of molecule, structure optimization, quantum mechanical calculations, electron density calculations, formatting of input and output files etc. Since it has an extensible plug-in based architecture, it helps to perform a wide range of applications. This software is licensed under GNU GPLv2. Avogadro is basically based on C++ language; its latest version uses python scripting. It uses Qt and OpenGL for graphical section and is introduced by Sourceforge service, which is available for Linux, Mac OS X and Windows platforms. It uses OpenBabel to load and save files which is a free software that is used to convert chemical file formats. Using Open Babel, different file types like PDB, CML, xyz, etc., can be opened with Avogadro after converting them to suitable file type supported by Avogadro. 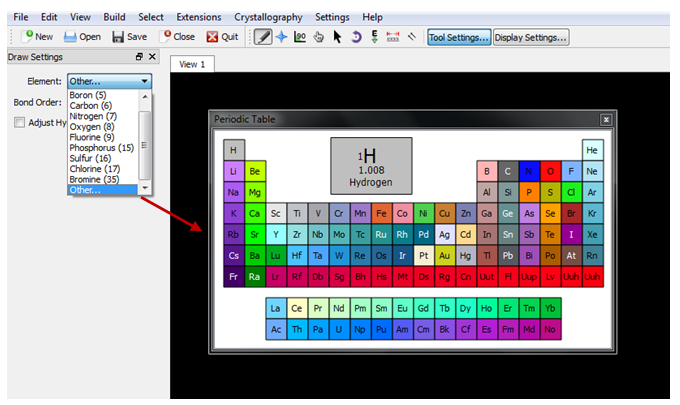 Figure 1 shows Avogadro software. From “Draw Settings” option, user can select different elements which will get displayed along with their atomic number. Clicking on the “other” option from the “Element” will show a periodic table that helps the user to select desired elements. By clicking left mouse button on a particular element in the periodic table, displays details including atomic symbol, name of the element, atomic number and its atomic weight. (Figure3 and Figure 4). From the “Bond Oder” drop down menu, it enables the user to select different types of bonds (single/double/triple). The “Adjust Hydrogen” check box enables user to add Hydrogen automatically to satisfy atomic valency. To create atom and bond, user can use pencil draw tool (F8 in keyboard). By holding the left mouse button, user can create atoms and bonds. User can delete the molecule by right clicking on the molecule. 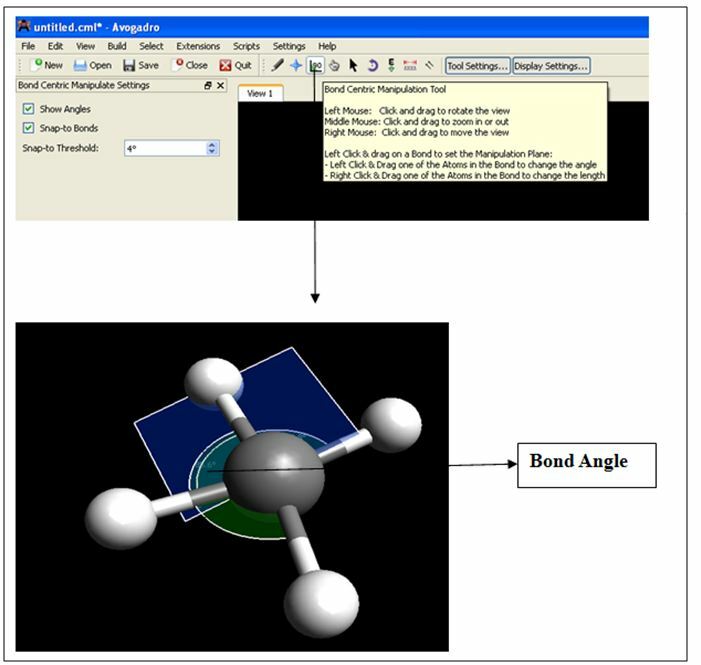 The navigation tool (Figure 4) next to the pencil icon helps to rotate the molecule by holding and moving the left mouse button. The Bond Centric Manipulation tool and Manipulation tool are used to manipulate the molecules that are already drawn (Figure 5 and Figure 6). The Bond centric manipulation tool helps to change the angles, dihedral angles and bond lengths of the molecule. By holding on the left mouse button, it displays the angle of a bonded atom. Clicking on the bond using the left mouse button displays angle as well as bond length on the bottom left side corner of the window. Click on the selected bond with left mouse button and drag it to change the bond angle. Click on an atom neighboring the bond and hold the left mouse button to change the dihedral angle. The “Snap-to-Threshold” (“Snap-to Bond”) tool helps to identify whether the angle plane “snap” gets close to the neighbourhood bond. 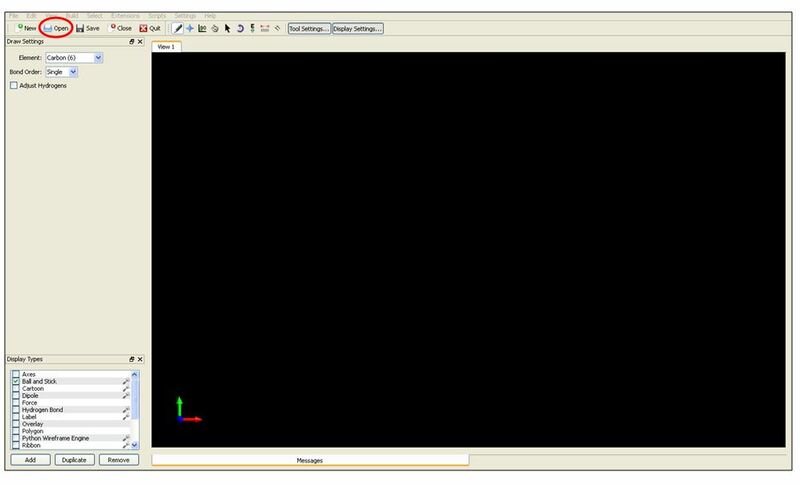 The Manipulation tool helps to move the individual atom or selected fragment in space by holding and moving the left mouse button. Clicking on the selection mode (on top left side of the panel), the user can select atom/bond or residue or molecule option. The Auto Rotation tool is used to rotate the molecule automatically by adjusting the rotation at x, y, z coordinates (Figure 7). Auto Optimization Tool can be used to optimize an already drawn molecule (Figure 8).